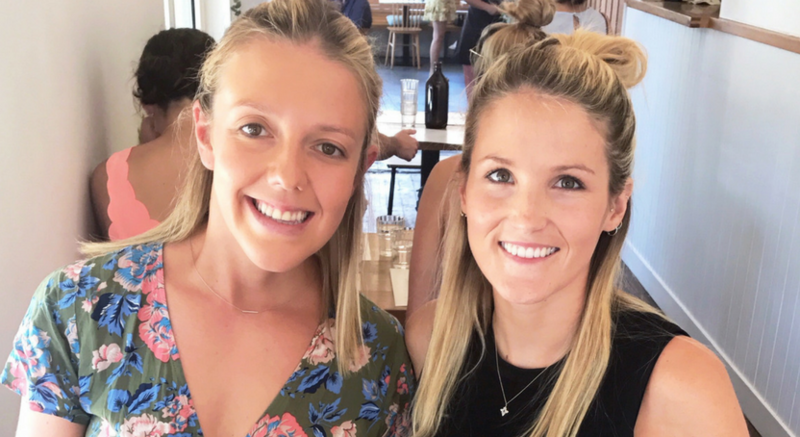 We recently spent some time in Melbourne and were blown away by how many amazing places there are to eat at! We were there for 7 days and still weren’t able to get through even half of the cafes and restaurants on our list (yay that means more trips this year)! 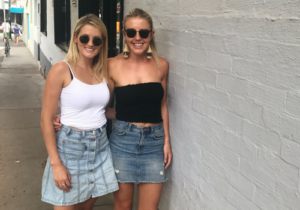 We thought we’d share with you some of our favourite spots and if there’s any places you love that you think we should check out then please let us know! Little Big Sugar Salt: Honestly one of the best acai bowls we’ve ever had! We’re pretty fussy when it comes to acai (now that everyone offers it) – we often find the texture and sometimes even flavour just isn’t right. 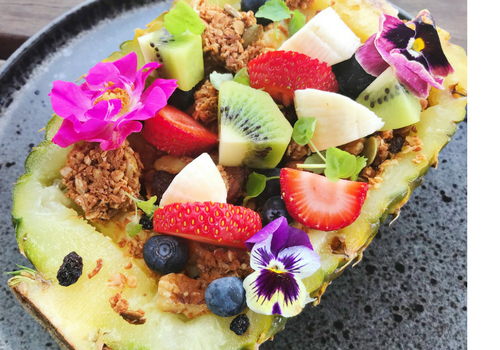 These guys bloody nailed it – the combination of muesli, fresh fruit and fluffy coconut yoghurt is perfect! The other dish we got was the Sticky kumara, poached eggs, kimchi, cashew cream, leafy greens (with a side of avo of course)- how’s that for a handful of random flavours all mixed in to one dish! This was one of our favourite breakfast stops of the trip! Left Field: This cute little corner cafe in Carnegie is not one to miss! We loved the Middle Eastern vibes with the delicious tastes of sweet potato and beetroot hummus and pistachio dukkah. 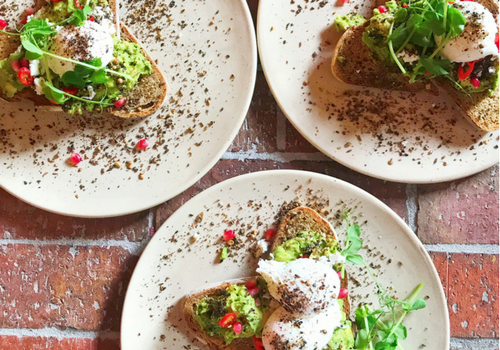 If your an avo lover then rest assure you can get your daily dose of smashed avo (+ peas if you wish). For all you Instagrammers, these guys go to huge efforts to make the plates look bright and colourful (yes there are edible flowers too!). Collective Espresso: We found this goodie located in Camberwell (just 10kms out of the city). 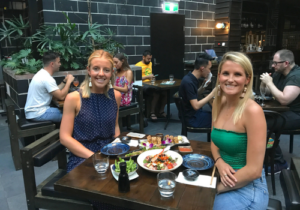 We popped by on one of our busiest days in Melbourne and were pleasantly surprised by the big portions (no need for lunch!). 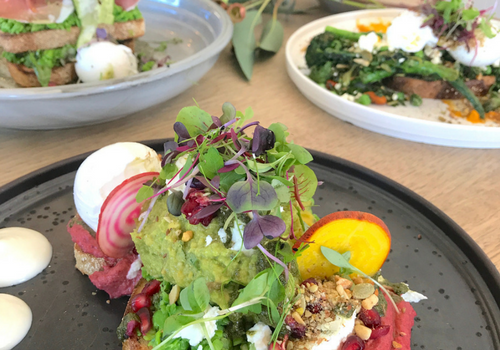 The menu names are creative and as you can guess we devoured “The No Brainer” aka Smashed Avo and “The Collective Sigh Of Relief”. Bentwood: We stumbled on Bentwood as we were about to begin our Fitzroy shopping trip! 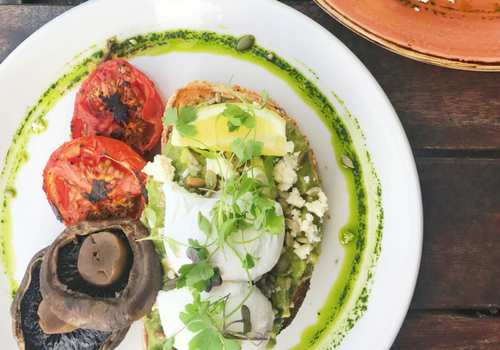 We kept it simple here and both ordered the smashed avo with poached eggs (you can’t go wrong!). (As a side note, that is not pepper on the plate – it is dukkah). This is a new cafe in Fitzroy with an awesome vibe and the staff were all heaps friendly! Blackgold Est: A very cute little cafe located in Richmond. 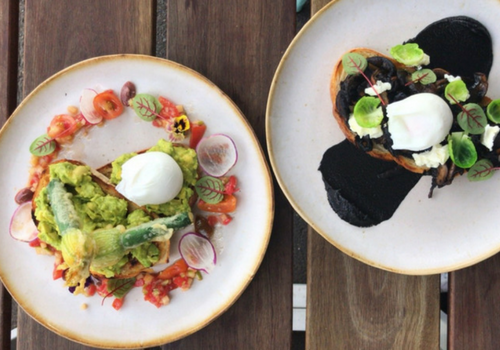 There’s nothing plain or ordinary on this menu, the smashed avo comes with zucchini flowers (OMG) and the mushies on toast were served with mushroom ketchup (YUM). 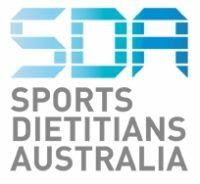 Given our obsession with pineapples (it’s even in our logo) we couldn’t go past the Pineapple superbowl either! Short Straw: This was our second time visiting Short Straw Cafe in Hawthorn. 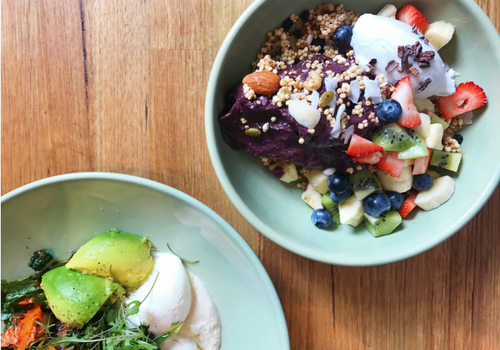 From smashed avo to waffles to poke bowls, this cafe has something for everyone. Our boys devoured the New York Style Chicken Bagel and the Sumo Fried Chicken Burger while we tucked in to the Poke Bowl. 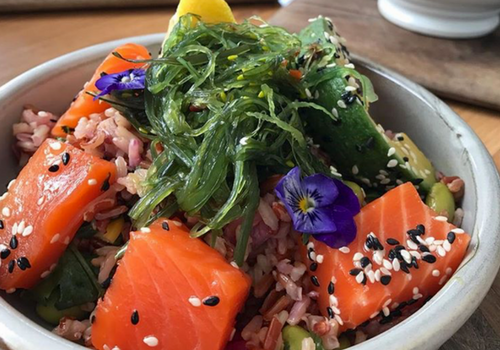 We’re poke obsessed and the cured sesame seed salmon in this one is delish! (Apologies for the lack of photos – they never turn out as well in the night! If you head to the Instagram accounts for all these places you can see photos!). Ichi Ni Nana: As difficult as the name is to get right – the one thing these guys do nail is the food! 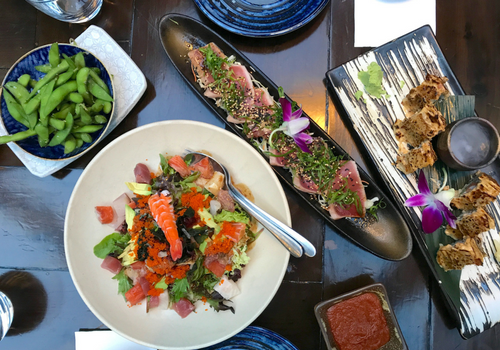 From spicy edamame beans to sashimi to volcano sushi rolls, we were certainly wowed by this place! If you’re a foodie, you’ll love the natural outdoor lighting at this beautiful restaurant! This one takes the award (in our opinion) for best Japanese place in Melbourne (and that’s a big call). Tippo 00: We actually stumbled across this one as it was nearby our hotel and boy was it good! It wouldn’t be a foodie trip without some good quality Italian. This delicious pasta bar in the heart of the city certainly hit the spot for us! Mamasita: The name says it all..Mamasita means ‘hot babe’ in Spanish, so of course we had to check it out (haha only kidding but seriously ;).The food was deliciously fresh and not too fancy. From the grilled fish tacos to the juicy corn cobs with chipotle mayo and lime, every mouthful was delicious! We may have treated ourselves to a Margherita too! Chin Chin: Even though we have a Chin Chin’s in Sydney now, you can’t go to Melbourne without stopping by this iconic Melbourne restaurant. It’s definitely not your average thai restaurant – the dishes are so packed with flavour and the restaurant vibe is awesome! Well worth the hour and a half wait! Transformers: If you’re a vegetarian or vegan then you’d go berserk over this one! While we’re not either of these, we certainly appreciate an innovative plant-based dining experience. Highly recommend the crispy chickpea panisse and the sweet corn fritter fries for starters. The fried haloumi is one of the best we’ve ever eaten (ever!) and the freekeh salad and cumin braised eggplant were divine. The Cos salad was a great refresher with the perfect amount of crunch! 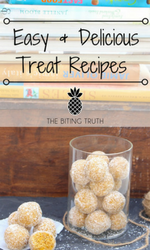 Can’t wait to plan our next food safari in Melbourne! 🙂 To check out some of the images from our trip, jump on to our Instagram page @thebitingtruth. Please contact us if you have any hot recommendations on other places to eat in Melbourne!